As language teachers, one reasonably safe assumption we can make is that the learners will only have an explicit focus on language in their classes. Therefore as teachers, we must ensure our students get plenty of opportunities to revise during lessons. 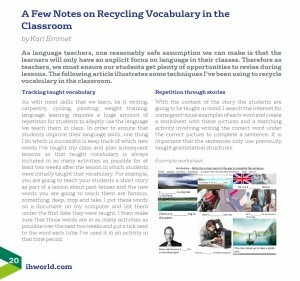 The following article illustrates some techniques I’ve been using to recycle vocabulary in the classroom. As with most skills that we learn, be it writing, carpentry, cycling, painting, weight training, language learning requires a huge amount of repetition for students to adeptly use the language we teach them in class. In order to ensure that students improve their language skills, one thing I do which is successful is keep track of which new words I’ve taught my class and plan subsequent lessons so that taught vocabulary is always included in as many activities as possible for at least two weeks after the lesson in which students were initially taught that vocabulary. For example, you are going to teach your students a short story as part of a lesson about past tenses and the new words you are going to teach them are famous, something, deep, stop and take. I put these words on a document on my computer and list them under the first date they were taught. I then make sure that those words are in as many activities as possible over the next two weeks and put a tick next to the word each time I’ve used it in an activity in that time period. 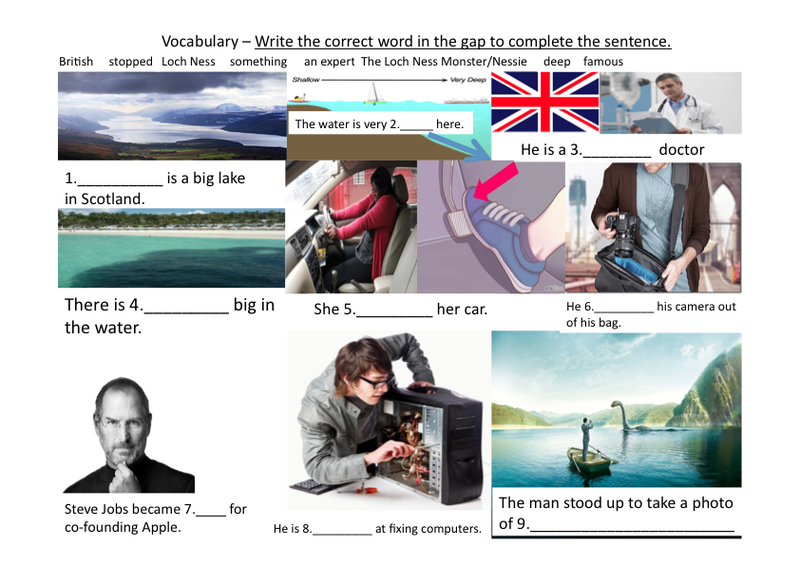 With the context of the story the students are going to be taught in mind, I search the Internet for some good visual examples of each word and create a worksheet with these pictures and a matching activity involving writing the correct word under the correct picture to complete a sentence. It is important that the sentences only use previously taught grammatical structures. After an initial warmer, show the class the PowerPoint slide which signals that vocabulary is about to be taught. It’s important to keep this slide the same throughout the time you teach the class as it primes them to learn new words. Elicit, CCQ and drill the pronunciation of each word and its example sentence. Show the students the vocab worksheet using either a visualiser or PowerPoint and demonstrate the word and picture matching activity and then the example sentence. Give each student one worksheet and set a time limit for them to complete it. Check the answers and then demonstrate the next activity with one of the stronger students in the class. The teacher looks at the vocabulary worksheet projected on the screen and starts describing one of the pictures on the worksheet. One student, who the teacher has chosen, guesses which word is being described and, after two examples, the students are placed in pairs and repeat the same activity with each other. The usefulness of this activity is that it helps the teacher see if the students actively understand the words and also demonstrates their strengths and weaknesses when it comes to describing language instead of simply translating it. 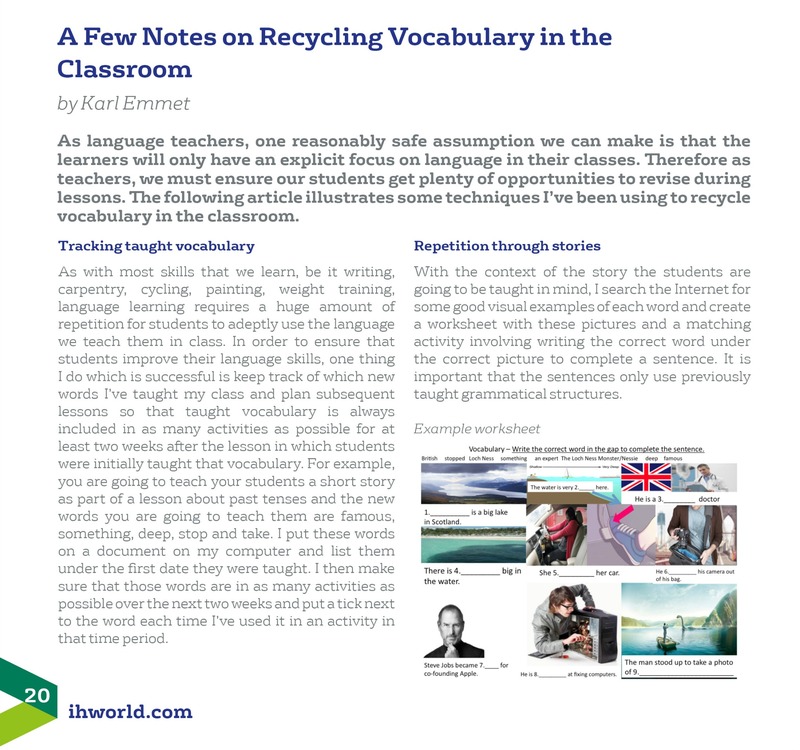 Furthermore, it gives students a chance to connect the new vocabulary with other words and phrases that they already know. The next activity is a time trial involving a “hot seat”/”backs-to-the-board” game where one team lines up in front of one teammate who is sitting with their back to the board and a word from the previously taught vocabulary is written above them. The person at the front of the line describes the word on the board and the person with their back to the board must guess the word that’s being described. Once they successfully guess the word, they stand up and move to the back of the line and the student who described the word now sits in the chair, a new word is written on the board and the next student in the line describes that word. The team that successfully describes the words in the fastest time wins. While all the students are still standing I take my copy of the vocabulary sheet and I turn it over so that I can see the example sentence on one side of the paper and the student can see the pictures on the other side of the paper. I say the sentence but I don’t the word that is underlined and the student must guess from the context which one of the newly taught words it is. I bring half the class behind me and do another example. This time I make sure they all see that the underlined word isn’t said. I check the instructions and pair the students up again to do the same activity with their partner. After that activity, the students are again arranged into two teams. Both teams stand facing the whiteboard except for the student at the front of the line. The student at the front of the line has their back to the board. The teacher writes a sentence on the board but with a word missing. The word is from one of the vocabulary taught that lesson. When the teacher says go, the two students facing away from the board must turn around and hit the gap where the missing word should go and then say the correct word that completes the sentence. Each student only gets one chance. If both students are wrong, there are no points awarded for that round. The two students go to the back of their team’s line and the process is repeated until one team reaches five points. With stronger classes, each time can write the sentences for the activity and the other team has to guess the missing word. Once the students return to their seats, the initial photograph that leads in to the reading is shown. During this lead-in process, the teacher should try to elicit as much vocabulary as possible from the students. The teacher can ask for the names of the different objects in the picture, what is happening in the picture, what might have happened before the picture, etc. Once this is done, the students commence the reading tasks. First, they check if their ideas about the text were right. Secondly, they answer some gist questions about the article. Thirdly, they answers some WH questions about the reading and finally they are put together into four small groups and each group must make five of their own questions about the reading. It is at this stage that the teacher needs to circulate and encourage each group to make at least one question involving a sentence that has one of the pre-taught vocabulary items. Once each group has a set of five questions, they change places so that a new group consisting of one person from each previous group is created. The students take turns asking and answering each other’s questions about the reading. Finally, the students use the vocabulary worksheet to retell each other the story they have just read. The students use a blank page and listen to the song once. They have to write down as many words or phrases that they hear in the song as possible, though these don’t have to be the target vocabulary of the lesson. Afterwards, the students share what words or phrases they heard with other students. Through this process the teacher can see what words have entered the student’s active vocabulary. Grouped in pairs, the students are given a song gap-fill worksheet with a picture next to each missing word. The students are instructed to look at the pictures in the song and deduce what the missing words are from the pictures and the context of the sentences. The song is then played and the students write down the words as they hear them. This process is repeated twice and then the answers are checked. Highlight an important pronunciation feature that occurs in three of the sentences of the song that use the target vocabulary of that lesson and drill the sentences with the class. The students are then encouraged to sing the song. This article details some of the ways that I have found to be successful in teaching adults vocabulary. I encourage you to try them, adapt them and I hope you find similar success with them in your own classes. Vocabulary Matrix – understanding, learning and teaching.